With Selena's plans for Earth revealed, Kara, Mon-El and Alura must find a way to escape Argo City. At the same time, J'onn prepares to say goodbye to his father, M'yrnn. Kara and Mon-El are strangely unphased by the explosion in Selena's secret room and their white clothes are surprisingly unsullied by the fire and dust kicked up by the collapsing ceiling. If Reign's whole purpose was to ultimately terraform Earth into a new Krypton, what was the point of her going around enforcing a more lethal form of justice when she first awoke? The death of Agent Demos is played up as being far more significant than it should be. While the character is one of the few named DEO background agents, he's hardly had enough screen time for his death to have much resonance. The heat-vision blasts in this episode act more like concussive beams than heat-rays, knocking people back rather than setting things on fire. James Olsen has nothing to do in this episode but come in and try and give Winn a pep-talk. Honestly, a lot of the emotional moments in this episode seem to misfire or are played off far faster than they should be, such as Alex and Alura meeting face to face for the first time. Carl Lumbly has stolen virtually every episode he's appeared in this season. This episode is no exception, though the interactions between him and David Harewood are easily the high-point of this episode and - speaking as someone who is losing his father to Alzheimer's - all too realistically portrayed. Chris Wood has prove far better at underplaying Mon-El this year than he was in overplaying the cocky frat-boy in Season Two. The moment in which he says everything while saying nothing while talking to Winn is a quantum leap forward in what we've seen him do with the character. The base idea of this episode bears some slight resemblance to the plot of the 1984 Supergirl movie, which briefly saw Supergirl trapped in The Phantom Zone and helpless to do anything about the villain - a witch named Selena. 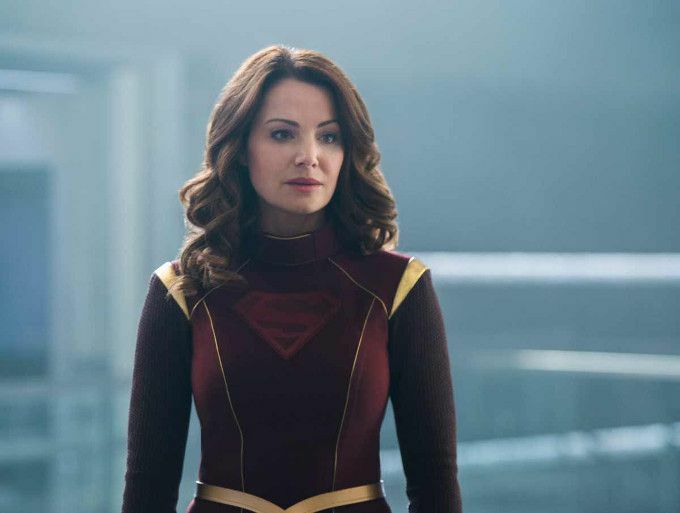 This episode sees Kara briefly trapped on Argo City with no way back to Earth, as it is threatened by a Kryptonian priestess with dark magical powers named Selena. The ultimate goal of The Daughters of Juru is revealed to be that of General Zod in the movie Man of Steel - terraforming Earth into a New Krypton. A new version of Selena was introduced into the reality of DC Comics Rebirth in Supergirl #10 (August 2017). This Selena was a powerful sorceress, described as Heir to Ataxia. She was convinced to join the villain team The Fatal Five, which was being led by Emerald Empress against Supergirl. She abandoned the team in mid-mission, however, wishing to avoid a losing battle and having no real grudge against Supergirl or loyalty to her new comrades. The two Daughters of Juru besides Selena are named Vita and Ayala. This is in honor of writer Vita Ayala, who co-wrote some issues of the DC Rebirth Supergirl series with Steve Orlando. At one point, Selena muses that Supergirl "actually cares for these humans." This line is a paraphrase of one of General Zod's lines from Superman 2 - "He actually cares for these Earth people." M'yrnn proposes merging himself with the planet Earth in order to stabilize it in the face of Reign's attacks. This is what J'onn J'onzz eventually did with the planet Mars in the reality of DC One Million. Harun-El is made toxic to Kryptonians by Earth's atmosphere. M'yrnn says that The Reach will allow him to live forever within his son's mind. Lena determines that Sam's body cells are reverting back to their natural state (i.e. Kryptonian) but her blood cells are oxygen deprived and shrinking, with some of them having become dormant. At Ruby's suggestion, Alex decides to try exposing Sam to the intense yellow sun lamps the DEO used for speeding Supergirl's healing. Winn develops an omni-directional self-maintaining sub-atomic personal shield - i.e. a belt-mounted force-field. It is based around a frequency conversion of some sort and is the cornerstone of the new non-lethal tech that Winn is building for the DEO. The dumbed-down explanation is that it is like a magnet for atoms. Zor-El had been working on a transmat portral - a teleportation device that could work across interstellar distances to send the people of Krypton to another planet. Lena uses her refractive scatterfield to test Sam's eyesight. Since Sam is able to see through the field and see Lena waving at her, we know that her body is not reacting like a Kryptonian's should. If Sam were a healthy Kryptonian, she would have hurt her eyes just trying to look at Lena through the field. Lena says that environmental factors can influence gene expression, turning it on and off. She theorizes she can use Harun-El to rejuvenate Sam's blood cells. Kara is able to use the cache crystals as a sort of impromptu radio, allowing her to talk through the hologram of Alura in the DEO headquarters. A multi-phase descrambler which links to a power source is part of the transmat mechanics. The insulator or Zor-El's transmat is cracked, meaning it will only be good for one trip. Alex's new gun fires ammunition that generates an electrical net capable of briefly restraining three Kryptonians. It works until the net is blasted by heat vision. She also has Kryptonite bullets and the glove of her costume can generate a Kryptonite energy field. Winn's personal force-field is shown to be strong enough to protect him from a Kryptonian heat-vision blast. It also keeps him from being killed when he is thrown against the wall by a Dark Kryptonian, though the concussive force is enough to knock him unconscious. The focused energy of three Kryptonians' heat vision, however, is too much for it, as Agent Demos tragically discovers. Eve Teschmacher reworks the Harun-El to try and jump-start Sam's blood cells. It does not work. Lena thinks perhaps she can make it work by adjusting the ratio of the solution she used before and reinject Sam with it. Lena determines that Sam and Reign are still connected by a symbiotic non-local entanglement. This means that Sam is getting weaker as Reign is getting stronger, despite Reign no longer being contained within Sam. M'yrnn and J'onn interrupt The Reach to help evacuate National City. Mon-El speaks of a world called Zune, who terraformed their world by digging to the planet's core, creating a Genesis event. The process took hours. M'yrnn says that is he uses his shape-shifting and phasing powers to merge with the nexus point of Reign's attack, he can help to stabilize the Earth by merging with it. M'yrnn: Home is not a place. It is living among those who love and honor you. I can depart this world with peace because I know my son is home. M'yrnn: These are happy memories. They should make you happy. J'onn: And they do, Father. But they also remind me how much I'm going to miss you. Every memory that passes between us brings us closer to that eventuality. M'yrnn: By the end of this, you will not feel loss, J'onn. You will feel complete. I promise. J'onn: How do you know? M'yrnn: Because I know the hole that comes with not knowing this. The way I felt when your mother was taken from me. When you were taken from me. Be patient, my son. Let the memories fill you up as you have filled me up. Winn: (unconvinced) Uh-huh. Always the hero. Mon-El: I lost her once, man. I'm not sure I can do it again. Winn: Wow, really? Dude. Dude, forget Reign! You need to get back here fast so we can get a drink! Selena: Give me the blood. Kara: You want the blood? You can have it. M'yrnn: This planet is my son's home. I intend to save it with him! Lena: Yeah. Sam's no better. And now three people in National City with the same powers of Supergirl have just murdered somebody. Eve: Oh. That is not good. The Daughters of Juru had a prophecy which foretold of three of them standing on Earth in order to bring about the rise of Reign. The three members of The Daughters of Juru are revealed as Selena, Vita and Ayala. Selena had an atlas of Earth in her secret quarters. Kara identifies some of the writings on the atlas as being identical to those in Coville's journal. She recognizes them as the instructions to create a Worldkiller from 319. Sam is not feeling well but has not transformed into Reign again. M'yrnn comes by the DEO to say goodbye to Alex. The Reach ceremony requires a Martian artifact called The Staff of Kh'ollar. Alex is left in charge of the DEO while J'onn is away performing The Reach. Among the items on Selena's secret room, Kara finds a scabbard which has "Whoever wields this sword shall bathe in the blood of the old worlds and reign with might over the new." written upon it. Alura identifies this as The Scabbard of Juru and the line as a quote from an ancient Kryptonian religious text. Selena leaves behind a hologram of herself that speaks to Alura along with a fire-bomb trap that wounds Thara. Selena explains that she gave Kara the Harun-El because it was necessary for Sam and Reign to be separated in order to enact the final stage of her plan and helping Kara saved her the trouble of doing it herself. Sam says that she was feeling totally normal but now feels so weak she can barely hold her head up and that her insides are melting away. Agent Demos has some kind of grudge against Winn. The gravity manipulator Mon-El purchased in 321 is destroyed by Selena's trap. This means he cannot use it to contact The Legion and have them come to help get him and Kara to Earth. Kara spent many afternoons watching her father work in his lab. He often used her as a sounding board for his ideas. She remembers him always talking to her as if she were another scientist. The ritual to bring back Reign fails because they do not have the blood of Purity and Pestilence. Luckily, Thomas Coville knows that blood samples can be found at the DEO. Lena uses her refractive scatter field from 319 to test Sam's vision. Selena was able to get Zor-El's transmat mostly-functional. The problem is that it would require another transmat portal at their destination in order to function. The DEO has a transmat portal, which Winn recovered in 209. The DEO also has Kryptonian cache crystals, like the ones in Zor-El's lab. There are 500 million potential moves on an Ok'Rock'Tock board. Alura comes to Earth with Mon-El and Kara. Agent Demos dies after being hit by the heat vision of all three of the Daughters of Juru. This turns out to be too much for Winn's new force-field belt to cope with. Eve Teschmacher is still working in Lena's lab, helping her with trying to save Sam. Enough of the dried blood of Purity and Pestilence remains on Serena's hand after Kara's heat-vision blast for her to sprinkle the ashes of it into the fire being used to reform Reign. The Fountains of Lillith are two fountains from ancient Kryptonian mythology said to be in The Valley of Juru. Alura learned of them from Jindah Kol Rozz, who ranted about them at her sentencing. One fountain gave infinite strength. The other gave weakness. Rozz spoke of a woman born of the fountain, who had the power of destruction - i.e. Reign. Kara theorizes that this may be the source of Reign's power rather than Earth's yellow sun. Sam asks for Lena to help her return to The Valley of the Juru (where she went in 317) so she can use the fountain to indirectly weaken Reign. Reign's awakening triggers an 8.0 earthquake in National City, super-storms and tornadoes in Madagascar and a tsunami warning. M'yrnn declares his intention to merge with the nexus point of the disaster, allowing him to stabilize it. On the one hand, the plotting of this episode is utterly nonsensical, with the reasons for Reign's existence having completely changed amid a host of minor things that don't make sense like concussive heat vision and the expectation that we're supposed to be deeply moved by the death of Agent Demos while undercutting emotional moments that should be more powerful, like Alex and Alura meeting. And yet... for everything this episode borrows from earlier Superman and Supergirl stories, the execution here is far stronger than in those earlier stories. By making the Kryptonians trying to destroy the Earth to create a New Krypton into religious fanatics rather than soldiers adhering to some elitist eugenics program, Supergirl Season 3 has corrected the biggest flaw with the plot of Man of Steel. For all its flaws, this episode largely works in spite of itself.